How to make a Pillowcase Draw String Skirt. Wash and iron pillow case. To make a draw string skirt measure the length you need for the skirt. The hem will be the pillow case hem so do not add additional inches for it. The casing for the draw string will need to be added at 1 ½” plus the turn under of ¼”. Iron a crease around the waist at the desired length. Remember this is a draw string waist so it may rise a bit when it is cinched in. Cut off unneeded length on the sewn side of the pillowcase. Measure down about ¼” from the ironed edge and find the center of the front measuring from side to side. Mark about ¼” from each side of center. This is the spot you will sew a button hole on each side of center. You will be sewing the button holes through only the front of the skirt using a single layer of fabric. These button holes will make clean holes for the draw string for the waist of the skirt. After you sew in 2 button holes open them with a seam ripper. Iron and sew ¼” down from the very top to make a clean edge for the casing. Next sew the casing in place sewing over the ¼” seam you just sewed, this time sewing it to the skirt. Set this aside. Use the left over top of the pillow case or bias tape to make a draw string for the skirt. If you are using pillow case material, cut a strip 1” wide and fold it in half (wrong sides together) and then tuck both edges into the fold with the right side still on the outside. Sew along the fold to secure this strip. If you are using prefolded bias tape, just sew along the folded side to secure the tape. 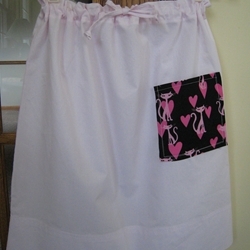 To make the ruffled look at the top of the casing sew ¼” down from the top edge of the skirt. Add any decorative pockets or trim at this time. Take a large safety pin and attach it to the end of the draw string. String it through the casing, making sure the other end remains outside the casing. Put a knot at both ends of the drawstring. Congratulations you have made a cute skirt for a lucky little girl.